I remember sitting in American History in 11th grade, wearing a pair of jeans that looked awful unless I was standing. 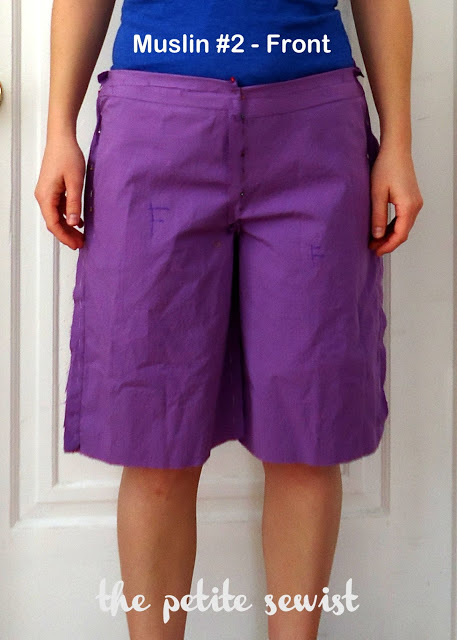 There was a horrible pouch of fabric right above the crotch when I sat and it made me feel like the pants were made roomy in that area for the opposite gender. This is not what an already self-conscious teen needed! Wouldn’t it have been nice if I’d known why they fit incorrectly? …And had known how to make pants that didn’t do that? The waist and hips were too big for me, so I took them in on the side seams, and this made the crotch baggier. You can see horizontal folds above the crotch but also folds at the hips. This is because I did my alterations in the WRONG direction. 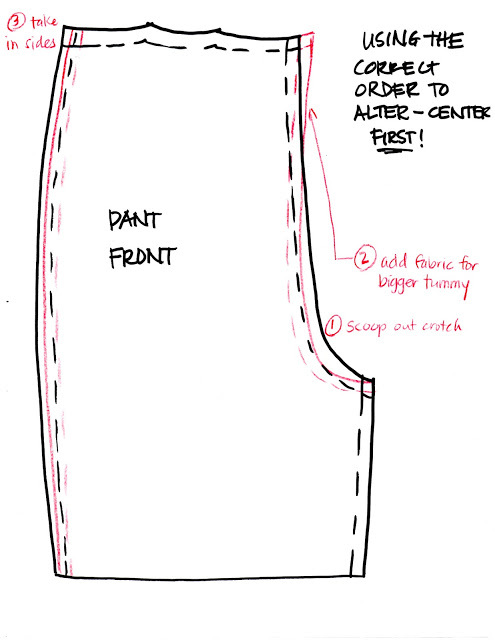 The correct way to alter pants is to fix the centers first, then move outward. I revisited my pattern. I knew that even before I took the sides in, I had a baggy crotch and needed a flat front adjustment. Draw a line from the sharpest part of the curve to the side seam. Cut to but not through the hip edge. Use the top piece as a hinge, and move it towards the crotch. 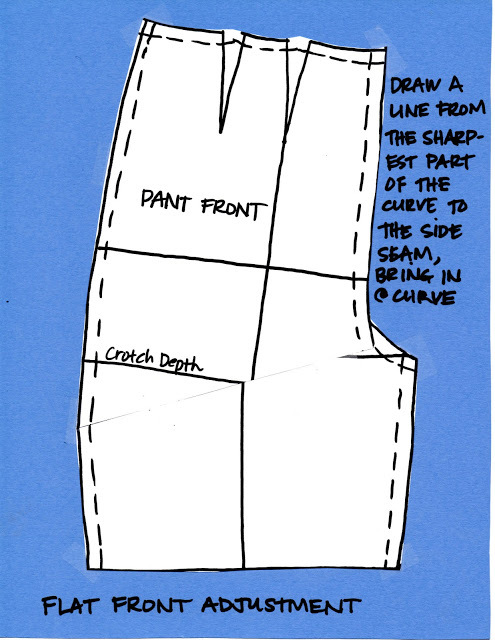 Essentially, what you are doing is taking out a triangle (or a dart) of fabric, starting at the sharpest part of the curve. 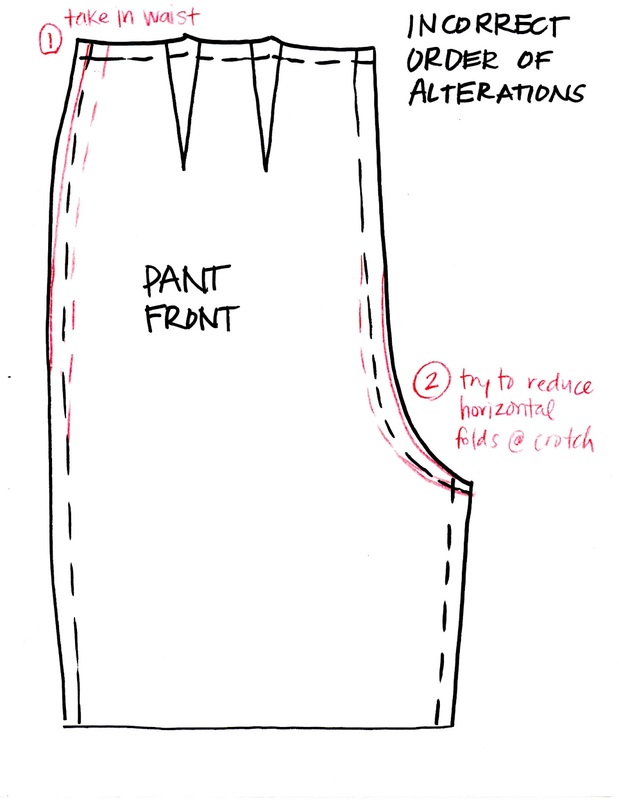 This shortens the crotch at the sharpest part of the curve, thus removing the extra fabric at the crotch. If you are confused, try this video. If you are just starting to get it, DON’T keep reading, because it gets more complicated below. 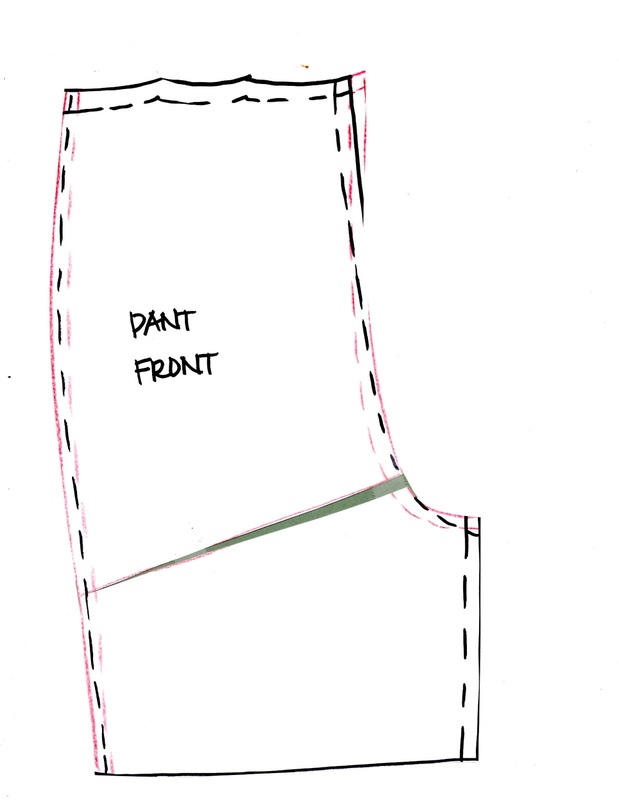 Going back to my pattern…. 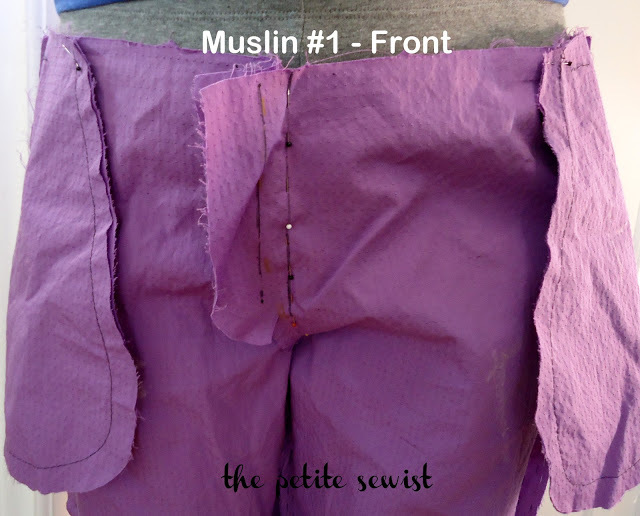 The second muslin is much better. The pants fit in the waist and the tummy area. However, there are still horizontal folds at the crotch. *%@!!! *Sigh. * Did I scoop too much out at the crotch? Is the inside of my leg too baggy? Please share you comments below if you have any advice for me. I’m totally willing to do a couple more muslins until I get it right. I have this same issue, being petite myself. I am enjoying reading your progress on this and look forward to your next installment. I avoid making pants for this reason. Hey, I just stumbled upon your blog today. Glad to know there are other petite ladies out there that struggle with the same issues. 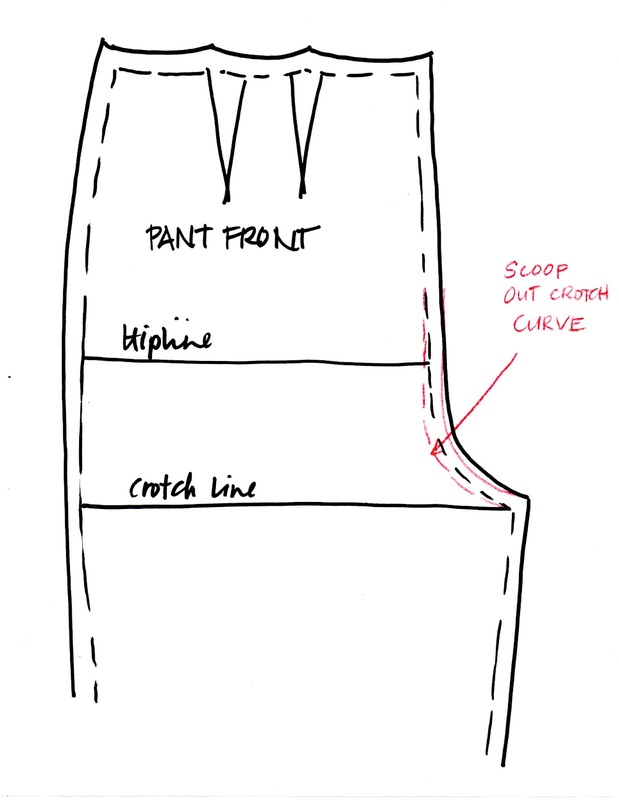 The front crotch curve is the bane of my existence, but after many trials and error and intense discussion with pant pros, I've come to a couple of conclusions that vary from what one expects from the standard sewing pattern. If I may- #1- the front crotch should not look like a perfect "J". the curve should be very subtle. #2- typical 5/8" seam allowance contributes a lot to the problems. 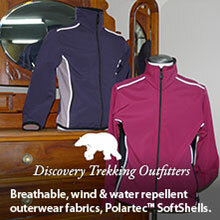 It fights the curves by restricting them from conforming to the body, especially if they are open pressed. 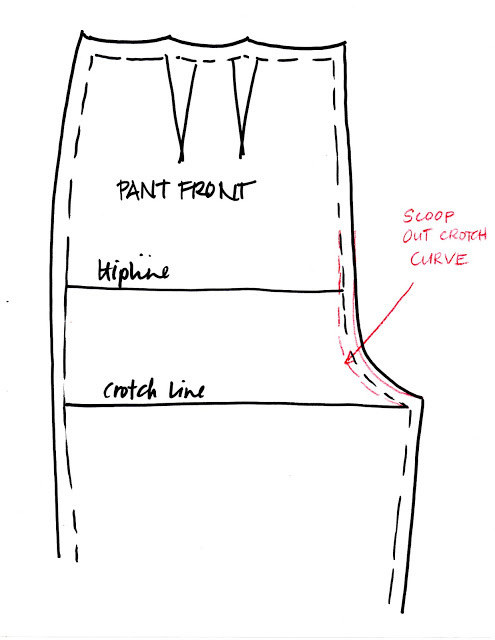 And for the love of all that is holy, please do not clip the seam allowance curves in this area. It weakens the seams. 3/8" seam allowance is really ideal. Anyway,I hope this is helpful rather than preachy. I have had such a hard time with the extra fabric at the crotch. At 5'8" I don't consider myself petite, but this was just what I needed. I will be using the flat front adjustment from now on. Thanks a million! Finally, someone explains in words I understand! I struggle so much to get trousers to fit!